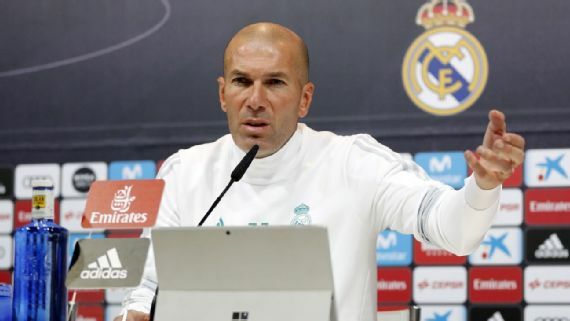 Real Madrid manager, Zinedine Zidane, has confirmed he held a clear-the-air meeting with his squad after training on Tuesday. He however insisted that the LaLiga champions are in crisis or need changes. Zidane’s men are 16 points behind league leaders Barcelona and local media is already reporting that there are disagreements with club president Florentino Perez over the need to strengthen the squad this month. Speaking ahead of Wednesday’s Copa del Rey round-of-16 second leg at home to Numancia, the Frenchman said: “I am not going to say what we talked about. “These are talks that can happen in the team. “You can analyse it as you like, say it is a ‘crisis moment,’ but we are here to look for solutions, to talk, and try to do things better. The chat was a bit longer than others, but this happens when we think it necessary, to get something out of it. When things are not going as we want, the answer is hard work.